As the at-home person in our small family, I think it's safe to suggest that I'm in control primarily of the family Christmas shopping. Like many people, I work with a gift list. Not like many, I do tend to spot good gifts on sale throughout the year, and purchase them then and there. If this happens earlier on or mid-year, I then have the tasks to keep the presents hidden from the upcoming recipient and for some, remembering I actually have them come December. I also have the odd moment of inspiration when the perfect needed gift appears. Nowadays I do a lot of my own shopping over the Internet – where there are often discounts, no queues, and I can have them delivered to my door away from the prying eyes of those recipients also. All of which requires organization, which I do with a simple digital list app. There are many good list apps or note apps which let you create lists. Available across mobile device platforms, several apps integrate into Evernote as my primary database of life. You will find these listed in Evernote's Online App Center. More and more lately, I've been using Cloud Outliner app for structural lists. 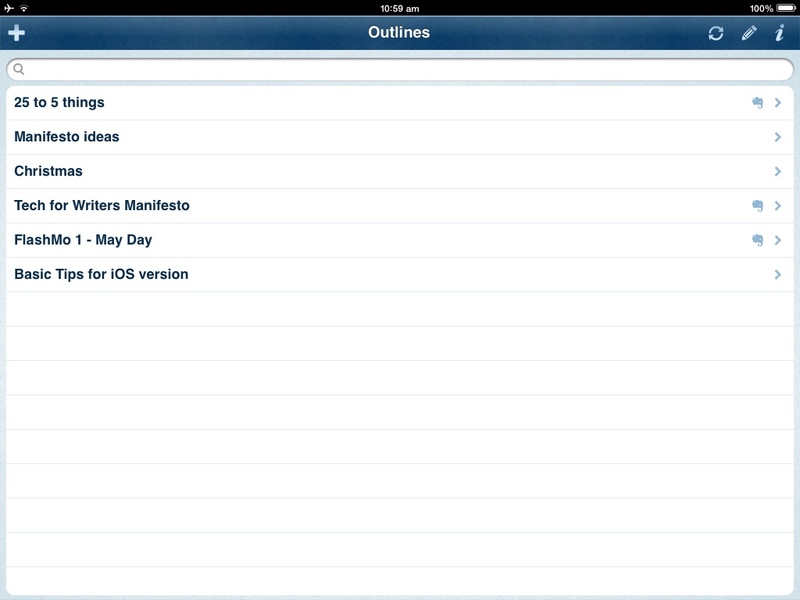 Of course, as a writer, I started off using Cloud Outliner for structuring my writing ideas (above). But I've found the app just as useful for my Holiday Gift List. The above screenshot shows my current Outlines index page, showing a mix of fiction, non-fiction and my Christmas gift list. Some already have the little Evernote icon beside the title, meaning the outline has been synced into my Evernote account, under a 'Cloud Outline' notebook which is created once you authorise the integration between the apps. 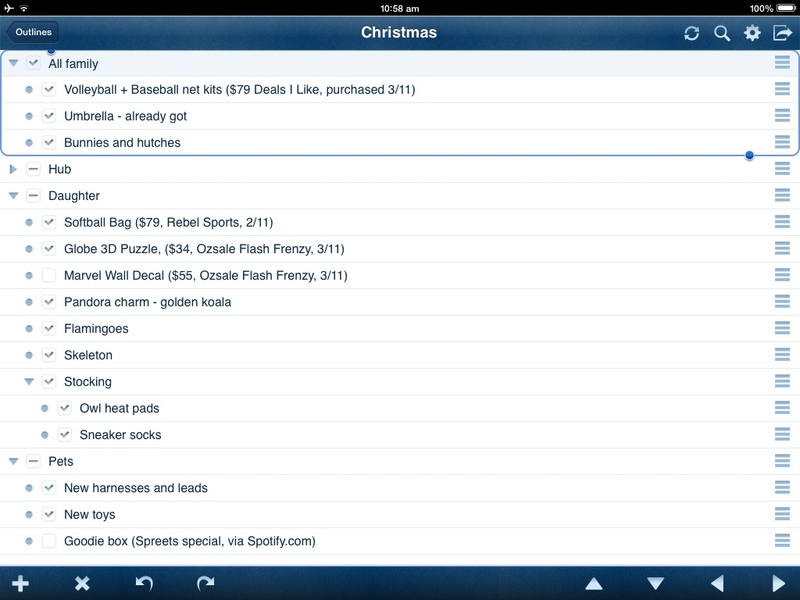 This (above) is a look into my Christmas list in the Cloud Outliner iOS app on my iPad. (I've had to close down the outline for my husband's list in this screenshot, in case he's reading this blog post). Before downloading the Cloud Outliner app I'd kept my Christmas list in another note taker over the past year, but it didn't offer the structure ability or integrate through to Evernote. Some of the earlier entries on my list have been copied over from that list. My method is very simple. I list the gifts as they are purchased, under family names and sub-headings. I also list some details if relevant – price, and where from. Cloud Outliner bullet points them and also can have checkboxes set on each list item – an option I use for the Gift List. As the gifts arrive (often delivered) I check the checkbox. Now that it's December, and closer to gift display/wrapping time, I will now be sending this list through to the Evernote notebook. Inside of Evernote, across my PC and mobile platforms, I can add to the list, or check off items as they arrive. Cloud Outliner, by XWavesoft, is an app available on the iOS platforms, including Mac OS. 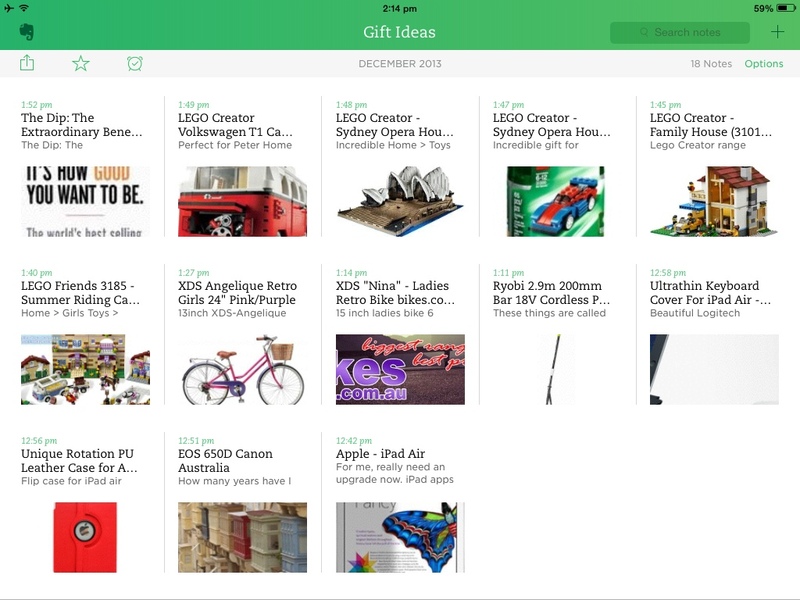 XWavesoft also do The Christmas Gift List app which goes the full hog, and let's you database your gift groups, and search by status, but doesn't have the Evernote integration I like. Cloud Outliner. Side note for the Writer: Cloud Outliner and Evernote together mean that you have some valuable structural and management capabilities for writing projects. For my outlines for a couple of manifestos, I use the checkboxes to indicate when I've done (written) that part of the project. Inside the cloud outliner app, you can restructure easily, pulling the line item down or up in the outline, or indenting into or out of a level of the outline. Like many modern families, mine is an international mix, meaning we have gifts to send overseas and ones sent to us from overseas also. All impacted by the high costs of international postage. Yesterday we sent off a medium sized package of gifts to Britain, the cost of postage as much as the actual cost of the items inside. Thankfully nowadays international credit cards are more readily accepted for online purchases in several countries, letting us circumvent the packaging and sending across waters totally (and the 3 month risky wait of sending by seamail). I used to have some bad vibes with wish lists. It was something about all those materialistic brides-to-be who stuck expensive gifts onto gift registries perhaps. But with the advent of Amazon wish lists I began to consider them an option. Once married, and with the realization that I had a partner who sometimes didn't have much of a clue what to get me, but really wanted to get me something considered and personal, I began to see the practicality of keeping wish lists for other people to buy for me. There are wish list apps, websites or associated functions inside of stores (such as the fore mentioned Amazon wish lists) but then you have to go and remember your account IDs, and share links, perhaps for multiple items across different websites. Instead, an easier all-in-one solution exists which I work with daily. An iOS app called Hop.in which provides a browser search allowing for double-clicks and swipes to send images (with URLs) or videos or portions of websites straight into Evernote (also, Facebook or Twitter) – this app was very recently recommended on the Evernote Blog for holiday clippings. I've had a couple of problems with images not synching through to Evernote, but Hop.in makes wish list making quite easy and fun. or sometimes from emails I have received from online department stores and forwarded into my evernote account. The Gift Ideas are culled every few months, or as I purchase items. I also collect clippings into the Gift Idea notebook for items I would like, should anyone ask, including links to purchase sites, and approximate costs (at point in time). I aim for a large range of gifts at various price ranges from ones for millionaires who may take pity in me in a dreamworld, to small items that I desperately need but never get around to locating and buying (like the clothes pegs on the list this year). * Note: when sharing notes or notebooks from Evernote, be aware that these are publicly accessible links. Somebody searching or browsing through Evernote public links may accidentally find your shared notes. Premium Evernote users can require the notes be accessed by users using their Evernote logon credentials but the notes can still be found. As such, don't put personal information onto your wish list shares (such as your name, or address details or the fact you have an account under an online department store etc). My Gift Ideas list currently has an iPad Air, a Digital Rebel, some retro bikes for my daughter, lego collections, some books, a pole pruner (not for me! ), a pet carrier (again, not mine), some garden gnomes and some clothes pegs on the list, among others. I'm crossing my fingers on those pegs. #IWSG Post: New Year, New Goals, New Me?